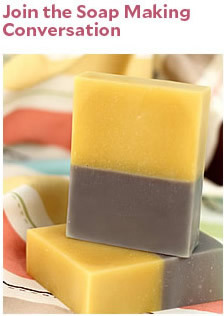 ONE: Chop and melt 21 ounces of the Stephenson Ultra Clear Soap Base in the microwave using 20-30 second bursts. Once completely melted, add .4 ounces of the Apple Macintosh Candle & Soap Fragrance Oil. Stir to combine. 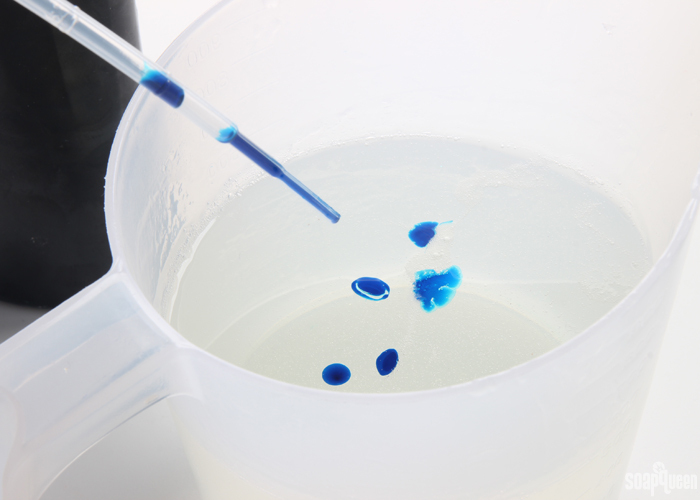 TWO: Add a few drops of the Brilliant Blue LabColor and stir to combine. Feel free to add more color if you’d like, but you want a light blue shade so you can still see the fish inside. 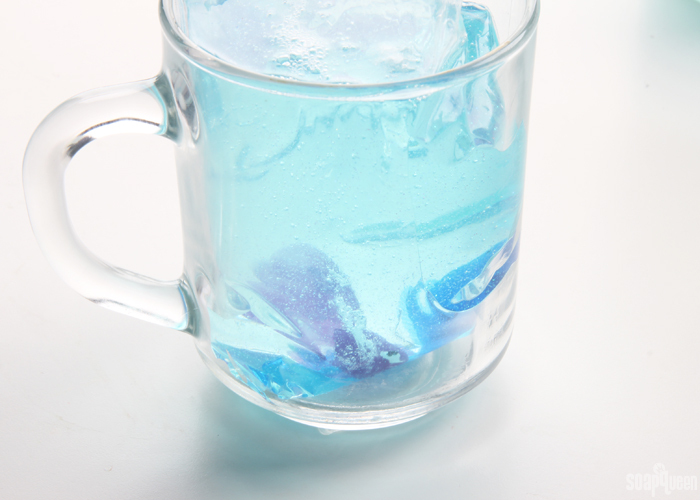 You can also omit the blue colorant completely if you prefer the look of clear soap. 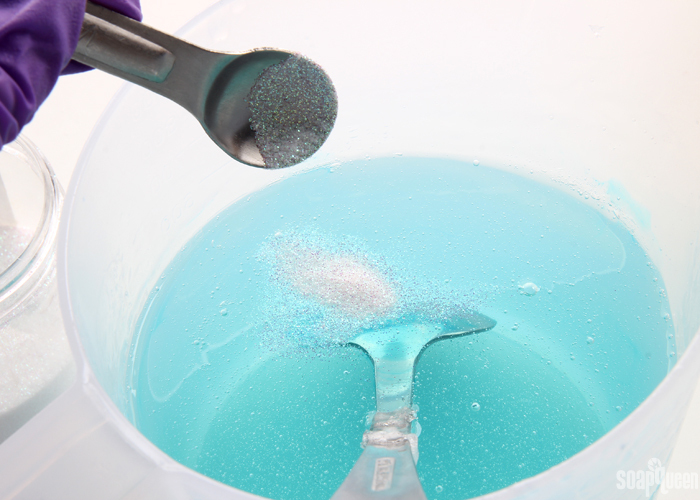 THREE: Add a pinch of Fine Iridescent Glitter until you’re happy with the amount of sparkle and stir to combine. 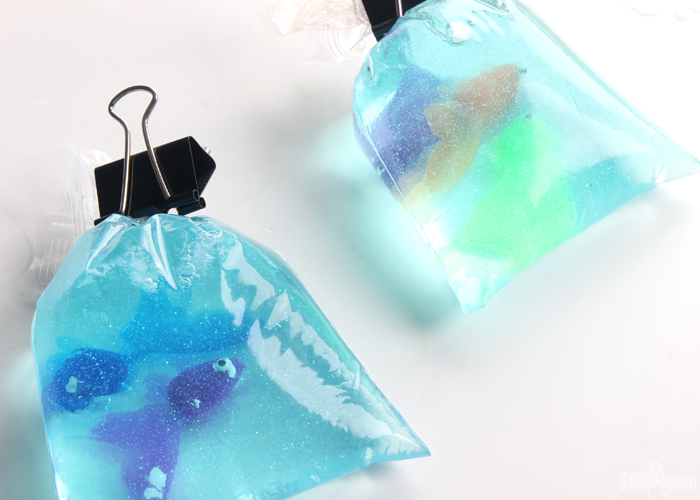 For this tutorial, we used small 4″ x 6″ plastic bags similar to these. 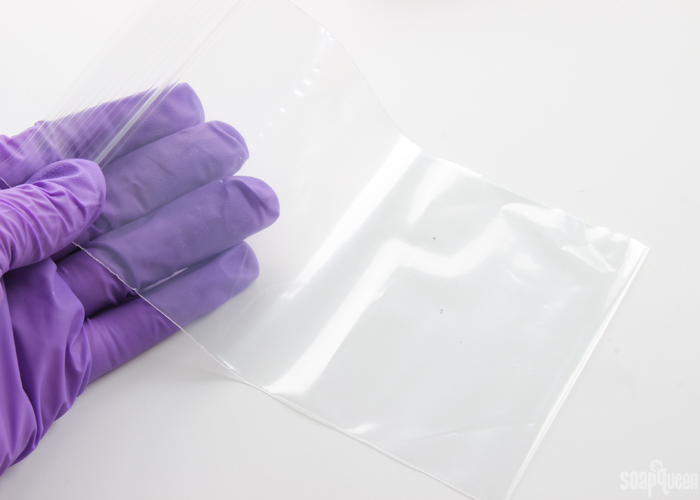 We also tested basic sandwich bags, but I liked the shape of the longer bags shown below. Feel free to use whatever bag you’d like for this project. 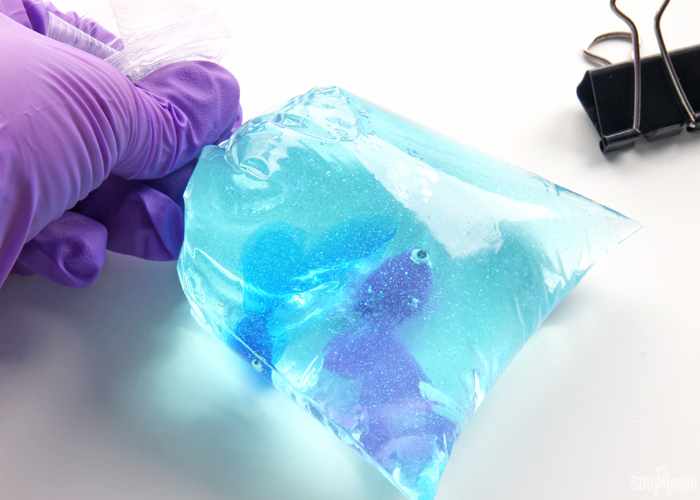 I recommend testing a bag first by pouring a small amount of hot, melted soap to make sure the bag doesn’t melt. 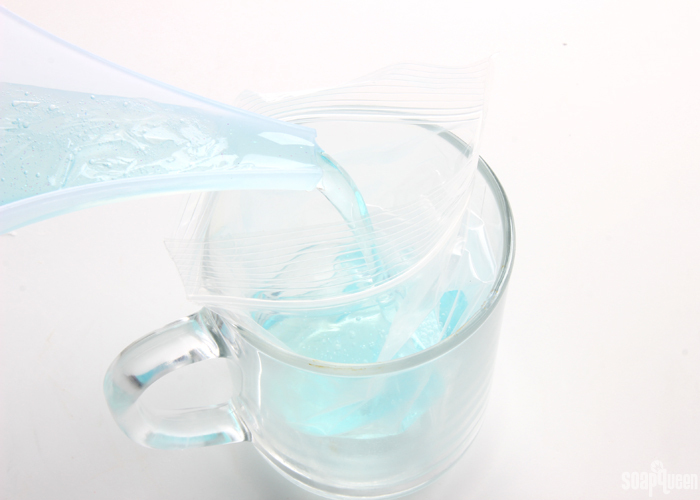 FOUR: To help with pouring the soap into the bag, you can place the bag into a small cup or container. This is optional, but it can help. It’s also a nice safeguard just in case the soap melts the bag. 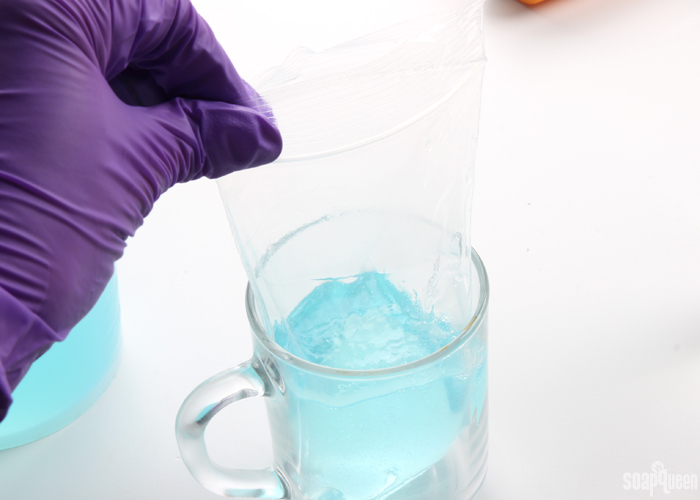 In our tests, the soap never melted the bag when it was poured at 135° F or below. 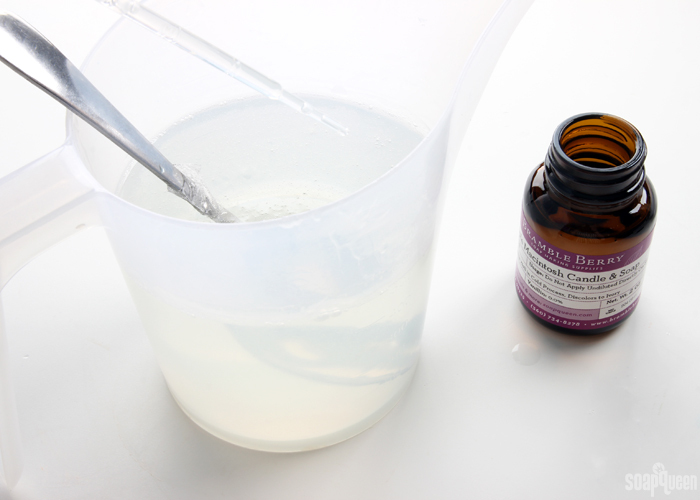 Pouring at a hotter temperature could melt the bag, so allow the soap to cool if necessary. FIVE: Once the soap is below 135° F, pour the soap into the bag until it’s filled as much as you’d like. 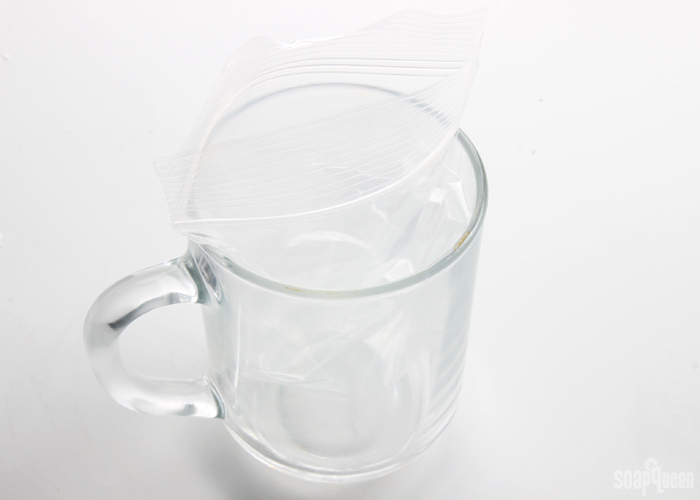 Don’t overfill the bag – there should be enough space at the top to twist it closed tightly. SIX: Spritz the top of the bag with alcohol to help disperse bubbles. 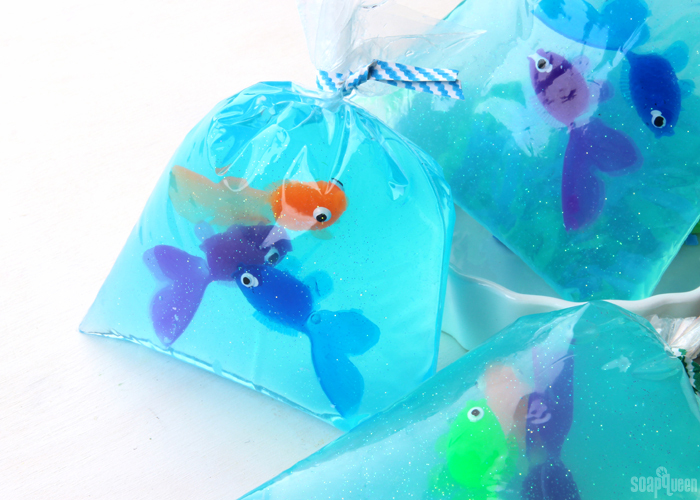 Drop 1-3 fish into the soap. If the soap is quite hot, the soap will sink to the bottom. SEVEN: Tightly twist the top of the bag, and use a clip with a very firm clasp (we used binder clips) to firmly hold it shut. Lay the bag on its side. This will cause the fish to fall to the side of the bag that is face down. Allow the bags to lay for about 10 minutes. 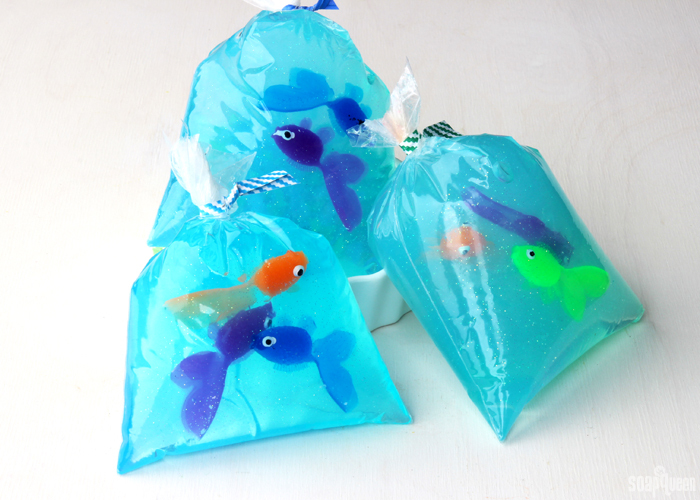 During this time, the soap will cool slightly and the fish will stay on the side rather than falling to the bottom. 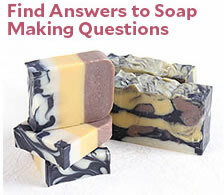 Once the soap has slightly cooled, flip the bag over. The fish should stay in place. 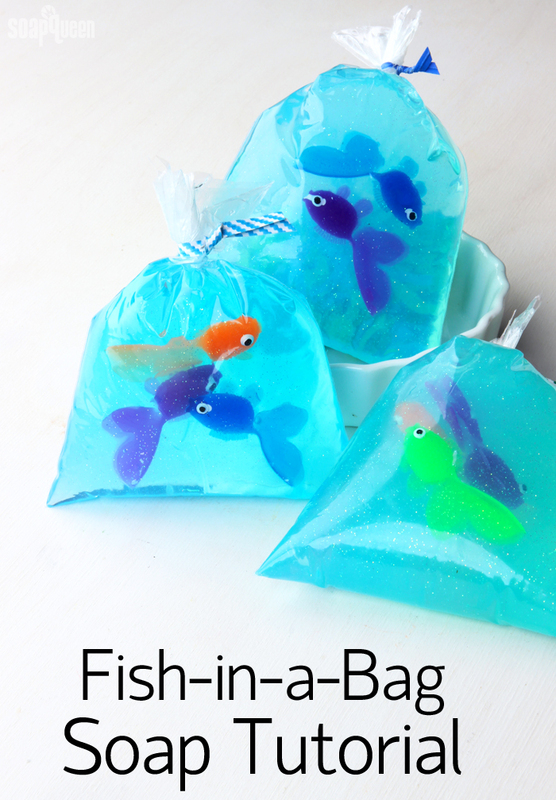 If the fish fall back to the other side of the bag, allow the soap to cool for a little longer face down. Once you’re able to flip the bag over without the fish moving, flip the bag to the opposite side and allow to fully harden and cool for several hours up to overnight. This way, the bag will be flat on the opposite side of the fish. Cut off the top of the bag if it has a zip closure, and use yarn, ribbon or a twist tie to “seal” the bag closed. Once you’re ready to use the soap, peel away the plastic bag and use. Enjoy!